The trailer starts with these two notions about love, this trailer has clichéd cuts, but the passion is raw. The extremely electrifying chemistry of Ranbir-Aishwarya has been talk of the town lately. The dialogues are witty and strong. Anushka and Fawad look like an icing on the cake. The film is going to be a power packed one with emotional performances, for which director Karan Johar is famous for. And if you look closely in the trailer, you can spot SRK in a back shot with Ranbir speaking to him. 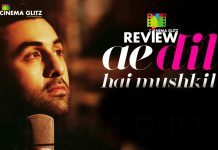 The trailer has a great travel and picks up with “Bulleya”, music is going to be a very strong suit for “ADHM”.